Anita and Marvin Cannon regard their four cats as family. 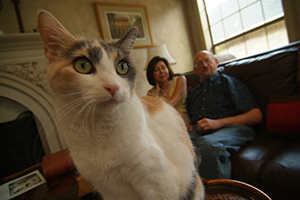 Since the couple has no children, the feline members of the Cannon clan are as close to kin as kids or cousins, but without opposable thumbs. All originally orphaned at a young age, Cali, Cooper, Cole and Lola now have the run of the Cannon’s spacious two-story College Station home. The Cannons further protect their furry foursome by keeping them inside at all times. Carpet-lined, cubby-holed cat condominiums, play toys and plentiful high and low hiding places provide ample entertainment for the Cannon cats. Each are loved unconditionally and given excellent veterinary care. With the Cannons as their faithful companions, these cats could ask for nothing more. But what if something happened to their adopted parents? Who would take care of them? The underpinning of the Cannon’s plan is the Stevenson Companion Animal Life-Care Center at Texas A&M University―a forever home away from home for animals whose owners have passed away or can no longer care for them. Anita and Marvin Cannon with one of their four cats that now lives at the Stevenson Center. The center is named for Madlin Stevenson, who, along with the W. P. and Bulah Luse Foundation, made the initial donations to jumpstart the project in 1993. Located on campus close to Texas A&M’s College of Veterinary Medicine and Biomedical Sciences, the 8,300 square-foot facility looks like a real home from the outside and was designed as close to a real home as possible on the inside, with living and dining rooms, bedrooms, a kitchen, bathrooms and several spacious backyards. Dogs and cats have the run of most of the house, while those who prefer or require more privacy live in their own special bedrooms. And it’s not limited to animals of the feline or canine variety. With a capacity of about 60 animals, the center has been home to dogs, cats, a bird and pony. In fact, an 18-year-old llama named Rusty, who has lived at the center for eight years, is one of its most notorious residents. More dogs, cats, birds, horses and donkeys are enrolled to reside there in the future. 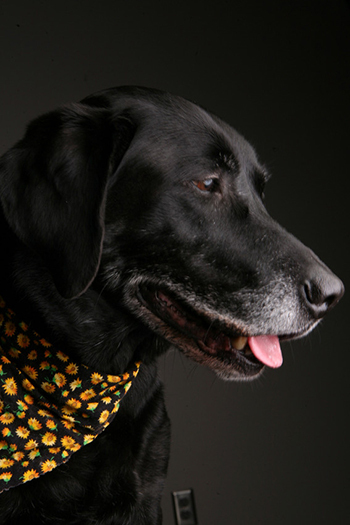 Since opening 15 years ago, the Stevenson Center has earned a sterling reputation for providing a safe, comfortable and loving home for companion animals at an affordable price. One might imagine a house of 20 animals as foul, unkempt and chaotic. In fact the opposite is true: Four permanent staff, four student residents and two student workers―all of whom are Aggies studying vet medicine―keep the house in ship shape and smelling fresh. Bathing, brushing, grooming, nail trimming and teeth cleaning―along with plenty of exercise―are part of the animals’ weekly regimen. Visitors who ring the front doorbell are welcomed by an enthusiastic animal entourage that leaves no doubt these creatures get top-caliber care. And that care includes unlimited lifetime services from one of the most respected veterinary clinics in the United States―Texas A&M’s Veterinary Medical Teaching Hospital at the College of Veterinary Medicine and Biomedical Sciences. Enrolling a pet in the Stevenson Center is straightforward and reasonably priced. The minimum endowment to secure enrollment depends on the age of the youngest owner at the time of enrollment. Owners can establish the endowment required for each animal by bequest through a will or trust, or they can fully fund the endowment at the time of enrollment with a considerable discount (See Table 1). Each endowment is invested and managed by the Texas A&M Foundation. The income from these endowments provides the operating funds for the center in perpetuity. “That peace of mind is twofold,” says Dr. O. J. “Bubba” Woytek ’64, senior development officer for the Texas A&M Foundation and one of the center’s founding fathers and board members. “We can assure the folks who enroll in this program that their pets will live out their days in an idyllic place and that the experts at the Foundation will wisely manage their endowment." A non-refundable fee of $1,000 per small animal and $2,000 per large animal is due at the time of enrollment if the endowment will be established by bequest. Only the portion of the endowment in excess of that required for the care of the animal for the remainder of its life in the center’s program may qualify as a tax deduction. When planning any type of charitable gift, donors should consult with their own counsel on tax implications, but Woytek and others at the Foundation can help design an individualized plan that will both fully fund the minimum endowment and offer participants the opportunity to support Texas A&M’s College of Veterinary Medicine and Biomedical Sciences in other ways. For example, when both Anita and Marvin Cannon pass on, their four cats will live out their days at the Stevenson Center and the Texas A&M Foundation will receive $70,000 per animal to create the Marvin S. Cannon and Anita S. Cannon Fund. The income from this investment will be used to provide support for both the Stevenson Center and the College of Veterinary Medicine. The Cannons also bequeathed an additional $200,000 to create a separate endowment to provide scholarships for deserving students in the College of Vet Medicine. Presnal cited numerous examples of enrollees whose gifts are supporting the future care of their pets and other academic pursuits. David and Jenny Bergen of Kingwood, Texas, have enrolled eight pets at the Stevenson Center. They have specified through their wills that, even if they don’t have any pets at the time of their deaths, they will provide funds for scholarships for the center’s student residents and the residual of their estate will fund a substantial gift to Texas A&M’s Small Animal Clinic. Neither David nor Jenny attended Texas A&M, but they are loyal clients of its vet clinic. Another enrollee from San Antonio created a future gift for the College of Geosciences as well as the center and another who worked at A&M’s Galveston campus will fund scholarships for vet students as well as provide for their pets’ care. Presnal says that less than a quarter of the 133 enrollees have designated auxiliary use of their endowment, but sees this as an emerging trend. The Stevenson Center’s $7.5 million endowment is now supporting its $230,000 annual operating budget. About 405 pets have been enrolled by their owners since the center opened in 1993. Seven of these owners chose to fully fund their endowments while still alive. But most enrollees fund their endowments after their lifetimes, by bequest, when their pets come to live at the center. Twenty pets are residing at the center and 33 pets have lived out their lives at the center. A typical small-animal minimum endowment produces about $2,500 income per year. Anyone who owns a dog or cat―or especially a horse―knows that even basic pet care costs a lot more. Presnal says the center pays the Veterinary Medical Teaching Hospital about $700 per pet annually for veterinary care. The center maintains a meticulous book keeping system. Ellie Greenbaum, Presnal’s long-time assistant, spends hours each month posting each pet’s expenses against the income of its endowment. These expenses include room and board, maintenance and utilities, among others. Although he now works only part-time, Presnal maintains a heartfelt devotion to the center and its residents. A retired veterinarian who practiced for 27 years and a graduate himself of Texas A&M’s vet school, he considers his position at the Stevenson Center a perfect fit and obligation. Like everyone else on the staff, his emotional attachment to each and every animal resident runs deep. It was difficult for Presnal to speak of two of his feline favorites who recently passed on—Bubba, a Siamese cross, and Jessica, a calico. But each sad passing at the Stevenson Center is coupled with the knowledge that these special pets were given the chance to live out their days according to their owners’ wishes in Aggieland’s pet paradise. For additional information about how you can support Texas A&M, contact Angela Throne ’03 with the Foundation at (800) 392-3310, (979) 845-5638 or athrone@txamfoundation.com.